Google Android phones have come a long way! It seems like Android has been on the market forever competing with big mobile brands like the iPhone. Google first Android phone was the G1 which showed at T-Mobile on October 22nd, 2008 (someone check my dates…). And here we are nearly 2 years later and T-Mobile has finally retired the good ol’ boy. The G1 can no longer be found on the T-Mobile website nor in the T-Mobile stores. You’ll more than likely need to hit up Ebay to find yourself a G1 from now on. 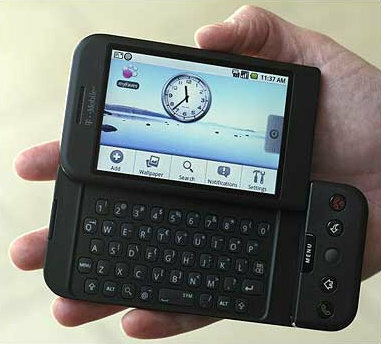 The QWERTY slider was unveiled in October 2008 as the flagship for Android and had many of the same platform features as later Android phones like the Hero. Its age primarily became apparent this year when some apps and Android versions would no longer run on its limited memory and processor. As of today, the oldest surviving Android phone on T-Mobile and in most places is the myTouch 3G, which arrived in the spring of last year. We are now looking at Android 2.2 coming to some of the highest end data phones in the history of the industry. Phones like Droid, Droid X, and the HTC Incredible will all be getting Android 2.2 shortly.